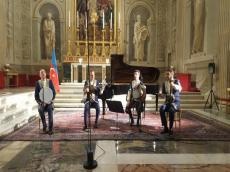 The 14th October edition of the popular "The Concerts at the Quirinale", which are lively broadcast by Rai Radio 3 every Sunday at the Quirinale Palace, official residence of the Italian President, was dedicated to the concert of Azerbaijani music. It was the first such concert live presented in the program of "Quirinale Concerts" to the large audience, Azertag reported. Addressing the event, the founder and host of "The Concerts at the Quirinale", professor Stefano Catucci spoke of the centenary of the establishment of the Azerbaijan Democratic Republic and the 10th anniversary of mugham’s inclusion in UNESCO Representative List of the Intangible Cultural Heritage of Humanity. He noted that the concert was jointly organized by the Heydar Aliyev Foundation, Azerbaijan National Commission for UNESCO, and Azerbaijan’s Embassy in Italy. He also recalled the latest visit of Italian President Sergio Mattarella to Azerbaijan and the visit of Azerbaijani First Vice-President Mehriban Aliyeva to Italy, stressing that these visits strongly promoted development of cooperation between the two countries. Professor gave detailed information about the Azerbaijani music, in particular mugham, the classical and modern Azerbaijani musicians, the rich cultural-musical heritage of the country. Stefano Catucci stressed that Karabakh is the cradle of Azerbaijani mugham and Shusha is the center of Azerbaijani musical art. Then, the members of "Beljan-Tar", ensemble-honored artist, tar player Sahib Pashazade, cellist Pierluigi Ruggiero, violinist Zoltan Banfalvi, pianist Luciano Di Giadomenico were invited to the stage. The ensemble performed an overture from the operas "Koroglu", "Arazbaras" by Uzeir Hajibeyli, a waltz from the ballet "Seven Beauties" by Gara Garayev, the composition "Shusha" by Farhad Badalbeyli and other works. The concert also featured the Azerbaijani mughams and folk songs performed by "Karabakh" Mugham Group. The artistic performance of the musicians caused great interest of the Italian audience. Recall that a similar concert program took place on October 12 at the Regional Council of Abruzzo.